Are You Getting The Right Audio Visual Equipment? 19 Jan Are You Getting The Right Audio Visual Equipment? Apple is regarded as one of the best presenters because they deliver a compelling story. They don’t have dumb luck, though. Apple pays attention to every single detail. They understand that their lighting, visuals, sound, and projections all have to be spot on. Apple spends weeks on rehearsal, adjusting all of these things until they are perfect. It’s no coincidence that Apple tells the best business stories. We don’t have weeks or the same budget that Apple does. Most small businesses don’t own their equipment or have in-house audio / visual engineers to design their setups. That’s why hiring the right people is absolutely essential and not all venues are created equally. Lighting is a science by itself and presents a real challenge to get right. Lighting doesn’t simply darken the room and brighten the stage. It forces the audiences’ eyes to focus on what you want them to focus on. It drives the audience through your story, highlighting the small pieces to create an emotionally compelling experience. It’s the same for projections too. Projection equipment is more of an art than a science. Two projectors can have the same lumen ratings and contrast ratios yet both will handle colors and lighting vastly differently. Projectors, and more importantly, projector screens, are tricky beasts and understanding them fully is needed for best results. Find our more about projectors in our projector rental guide. What are you presenting? Is it mathematical data explaining the latest engineering revolution? Maybe it’s that dream vacation home in the Florida Keys? That data intensive spreadsheet is going to require a crisper projection, maybe with a 3 panel LCD projector, while those pictures full of vibrant colors and rich saturation might actually be better displayed with a DLP projector. It’s an art to convince the human eye of what you want it to see. The new big thing is streaming presentations and events. It’s far more complicated than setting up a webcam in the back of the room and connecting it to Skype. Streaming presentations information is data intensive and tricky. It’s an IT and filming nightmare. Going about trying to set up your own streams is a disaster waiting to happen. Streaming requires a good camera crew, proper lighting, good on-the-fly editing, good sound recording and filtering on-the-fly, good tricasters and transcoders and more. It needs really solid information systems and audio / visual systems to pull it off. 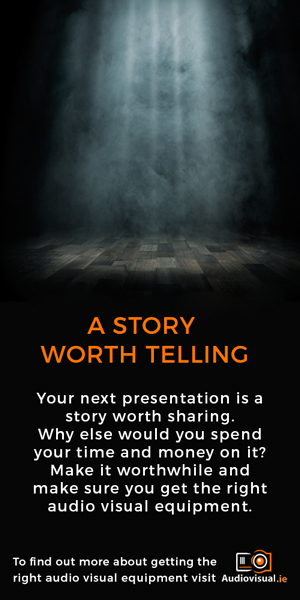 Your next presentation is a story worth sharing. Why else would you spend your time and money on it? Make it worthwhile and make sure you get the right audio visual equipment. Make sure that the story you are telling is being told exactly the way you want it to be. Remember, presenting is more than the words coming out of your mouth. It’s about the oh’s and ahh’s. Get the proper help and make sure the stage is set properly. It’s more than a presentation, it’s a performance. Make sure to get properly calibrated and installed av equipment so your performance doesn’t go flat. We can’t help you with the story writing but for the oh’s ahh’s we can make sure your audio visual set up is properly and professionally installed. Call me on +353 1 4133892, email me directly at ivan@audiovisual.ie or get in touch online and I’ll be happy to help you plan your next presentation!